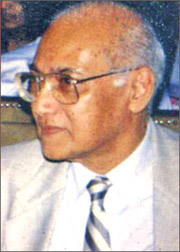 Retired higher public servant and a scion of distinguished family in the country and a man of versatility in writing possessing subtle humour and affection in him, Tissa Devendra is much known in the country as the former Chairman of the Public Service Commission and Salaries Commission. But his interest in the arts and literature are not much known. He is an author of five books in English. More than two decades ago he had scripted a TV documentary on the late George Keyt, a Lanka's pride in art. My late father Kailayar Sellanainar began his public service career as a Land Clerk in the Batticaloa (Maddakkalappu) Kachcheri before he rose up to higher positions in government departments. This came to my mind when I read that Cambridge scholar Tissa began as a cadet in the then Ceylon Civil Service in Land Kachcheris. Tissa is a clever storyteller with amusing anecdotes that keep the reader entertained. Some of his articles and memoirs are collected in a book form titled Memoirs of a Penpusher with added tagline - Kachcheries and Commissions published elegantly by Vijitha Yapa Publications. The book runs to 154 pages. 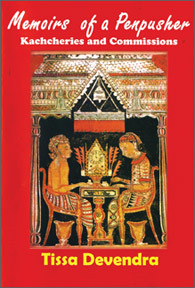 The cover picture is a Fresco from Kataluwa temple of a local official of the early British colonial period. There are photos, illustrations and sketches included. I first met Tissa Devendra in the studios of the then Radio Ceylon in the early 1960s when I was also a participant in a weekly program originally titled 'The Arts This Week', compiled and presented by the late Vernon Abeysekera and produced by Delorine Brohier. Many distinguished elite critics and broadcasters contributed to this program. Vernon Abeysekera, as some of our senior readers might remember, was a senior civil servant very much interested in the arts and produced stage plays. I liked Tissa Devendra's reviews of English films over the air as they were amusingly and attractively scripted and was free from highbrow analysis. They were simple and entertaining. Since then I appreciate his writing in the newspapers. "My title 'Kachcheries and Commissions' is self-explanatory. The first section is an insider's overview of the institution in which I spent most of my working life. It is, most definitely, not an academic treatise and is coloured by personal experiences 'to point a moral, or adorn a tale'. "The second section draws on the work that my colleagues and I did in the Public Service Commission, the Salaries Commission and the aborted National Council for Administration. The ripples caused by some of these activities have been recorded as well. Some articles written in reflective mode are also included." As for me I liked the first section better as it was more interesting than the second which is devoid of imaginative rendition of actualities in creative fashion whereas the latter part of the book is of interest to understand the politics of administration. Very useful notes on fragments of pre and post-independence Lankan history are recoded in the foreword by retired Secretary General of Parliament Sam Wijesinha. Young students should benefit. One must read the book to enjoy it. Judiciously I have avoided quotations from the book. At the launch of this book another by the same author at the National Libraries Board last Friday (March 4, 2011) a large number of distinguished administrators and other VIPs were present.